SMi Group are delighted to welcome expertise from a senior panel of big pharma and cold chain organisations and regulatory bodies, at the 13th annual industry leading conference on Cold Chain Distribution 2018, taking place this December in the City of London, UK. The event will address the impact of the overwhelming digitalisation of the supply chain process and how companies from biotech’s to pharma, need to adapt. 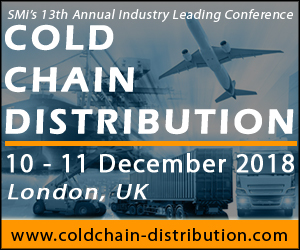 It will also explore the crucial challenges of supply chain visibility and data integrity in the cold chain industry. Hear from industry experts such as the IATA, MHRA, SeerPharma (UK), GSK, Sanofi Genzyme Europe, MSF and more!